One of the most influential books ever for entrepreneurs has to be Crossing the Chasm by Geoffrey Moore. Although a bit dated now (having first been published in 1991), it still provides amazing insight into the technology markets and the adoption of technology by consumers. Many startups fail to understand their markets. Moore’s book helps entrepreneurs to understand their customers better, and to cater to their needs. People congratulate me all the time for "launching" 412 Food Rescue. My reaction is always to say -- wait till we scale. I don't think it is hard to launch things. It's fairly easy to launch something. And it's easy to get drawn in by all the media and excitement around launch. But pushing out bright shiny objects is a canard for achievement. Scaling is hard. I've had this book since it was released and it's one of the classics on my shelf. 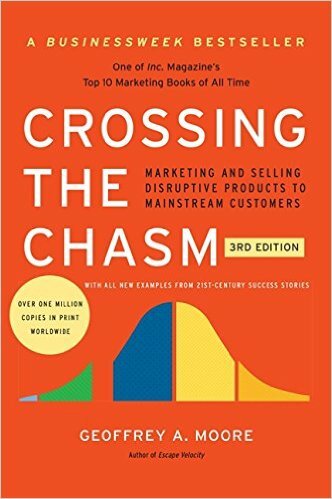 Crossing the Chasm, by Geoffrey A. Moore, is excellent for products that are moving from early adopters to wider market. Crossing the Chasm opened my eyes to the existence and reality of the hype curve, early adopters and the now infamous trough of disillusionment. It's a model that I've used to try to understand where certain products/trends are residing. Crossing the Chasm: classic on how to grow product market share. As a young kid coming up in the technology industry, Geoffrey Moore’s “Crossing the Chasm” helped me understand the evolution of market categories. I was able to apply his insights directly in my career and I’m grateful to him for that. The bible for bringing cutting-edge products to larger markets—now revised and updated with new insights into the realities of high-tech marketing.